From their Rockford home, one area architectural firm has created an international reputation for its creative, inspiring spaces. Chances are, you know the firm better for it’s work right here in our region. 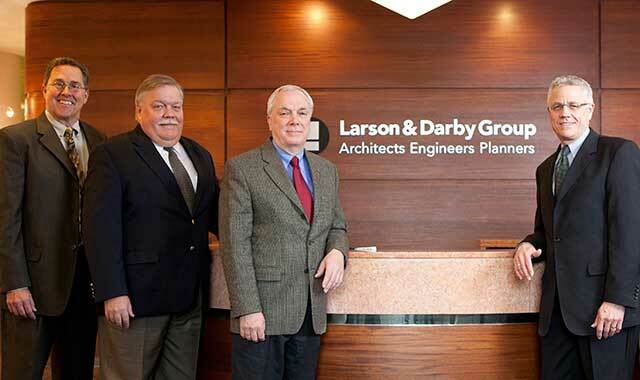 Larson & Darby partners Richard S. McClelland, AIA, NCARB, LEED AP; Dan J. Roszkowski, AIA, NCARB; William Waldorf, SE, RA; and John T. Saunders, AIA, NCARB, LEED AP. The Portland, Ore., manufacturer had a problem: How could it install machine foundations for some new, extremely heavy equipment, and keep the project on budget? Its architecture firm, Larson & Darby Group, 4949 Harrison Ave., Rockford, crafted a novel solution, one that was literally outside the box. Just call them the problem-solvers. That’s how Waldorf and the 45-member team at Larson & Darby see their work. To this talented group of architects, engineers and interior designers, the final product is often the solution to a client’s problem. They’ve solved problems for clients around the world, but you’re probably most familiar with the creative work their firm has delivered to the Rockford area for 51 years. A full-service architectural firm, Larson & Darby has transformed many a space since it was founded in 1963, and its diverse menu of services – from architecture and planning to engineering and interior design – has led it to work with a wide array of clients. About half of its work is related to manufacturing and industry, a niche that has taken the team across the U.S., and even into Mexico, England, France, Poland, Germany, Egypt, India and China. Larson & Darby’s creativity extends throughout the region, to publicly owned buildings such as the BMO Harris Bank Center, health care clinics including Freeport’s FHN and Dixon’s KSB, churches such as Heartland and Westminster Presbyterian, and even schools, such as an addition at the University of Illinois College of Medicine at Rockford. And that’s just a sample. Larry Larson and his brother-in-law, Sam Darby, began their partnership working small jobs around Rockford – a doughnut shop here, a Geri’s Hamburgers there. Their big break came when they landed a contract to design the headquarters and manufacturing center for Sundstrand, now owned by UTC Aerospace Systems. The original partners grew their firm over time, employing about 25 when Saunders and Waldorf arrived, and reaching nearly 120 employees around 2001. Larson, a more technically minded designer and businessman, had an architectural degree and an MBA from the University of Chicago. His expertise perfectly meshed with Darby’s more creative personality. Together, they instilled in their associates the principles of success. Larson retired in 1995, Darby in 2001. Now, Waldorf, Saunders and their fellow principals are the ones peering over shoulders. On every project, no matter its size, at least one principal is involved, occasionally as the chief drafter. Saunders remembers Larson’s and Darby’s dedication to hard work and their acceptance of progressive ideas, such as profit-sharing plans and generous employee benefits. But beyond the inside business practices, Larson and Darby instilled in their team a desire to provide quality service. And sometimes, making something better also means challenging a client to reframe their needs. In one recent example, challenging the client led to a fresh idea with surprising results. When Field Fasteners, in Machesney Park, Ill., wanted to double its warehouse size and expand its office, architects had to decide how they’d reconfigure and expand the pre-engineered structure’s footprint. The building expansion encroached on a favorite patio, where the company’s owner enjoyed grilling burgers. So, the new gathering space includes a built-in grilling station. Saunders and Waldorf find that their approach – providing multiple solutions to a problem – often leads to repeat business. In the case of UTC/Sundstrand, the relationship has continued for decades. Larson & Darby now handles both large-scale improvements and occasional small-time needs. For a manufacturer in Ohio, Saunders recently finished the firm’s ninth expansion since building the factory 25 years ago. Sitting in India, at BEHL, an energy and infrastructure engineer and manufacturer, Waldorf needed to make some adjustments for his international client. From his iPad, he contacted his office, shared the client’s requests and, within a few hours, had an updated computer-rendered model to show off. Compare that to the rolls and rolls of drawings Waldorf had to tote around earlier in his career. No stranger to technology, Larson & Darby was one of the area’s first architectural firms to embrace computer-guided design. Today, every aspect of building design is guided by 3-D rendering, also known as Building Information Modeling (BIM). This technology is radically improving the design process, making it easier for clients to envision their final structure, while reducing time and costs. The process isn’t just faster, it’s also more efficient and cost-effective, says Saunders. Because drawings can be sent electronically to clients and contractors, and renderings are completed digitally, clients no longer pay for rolls and rolls of paper. And, 3-D rendering also has its advantages for designers. As for construction techniques and technologies, Larson & Darby was one of the first firms in the region to embrace the Leadership in Energy & Environmental Design (LEED) standard for sustainable construction. Led by the nonprofit U.S. Green Building Council, LEED promotes smart design that incorporates energy and materials conservation, recycled and renewable materials, and overall efficiency. Currently, Larson & Darby has eight LEED-certified designers, including Saunders, who have worked on several “green” projects. One of the firm’s early LEED designs, and one of the first in Winnebago County, was a Kishwaukee Street facility for the Rock River Water Reclamation District. Using sustainable technology, the center was built with school field trips in mind. Technology has enabled Larson & Darby to open up new markets and reach clients in faraway places, but that increased access also comes with a cost. Chicagoland competitors are now finding their way into other markets, including Rockford. What separates Larson & Darby is the strength of its reputation. Many new jobs come through referral from loyal clients, while other relationships come about from its work with local aerospace companies, including UTC. Thanks to its smaller size, Larson & Darby remains more nimble than its larger competition. And the firm happily takes on small jobs for loyal clients. At the same time, the firm’s capable of juggling longer-term projects with imperative short-term projects, which often come from industrial clients. This brand of responsive service goes back to the values instilled in the firm’s founders, and its small-business identity. “It always goes back to service and quality, the same thing that any small business preaches,” says Waldorf. In their national and international travels, Waldorf and Saunders have witnessed an array of manufacturing and construction settings. In India, the monkeys swing across the girders, and the tigers wander into the work zones. Construction crews are unflinchingly casual. Even in other parts of the U.S., Waldorf says, workforce experience, skill and work ethic don’t measure up to that of our region. Here at home, Larson & Darby employees remain invested in the community, with individuals joining numerous local organizations. You’ll find associates engaged in Alignment Rockford, Transform Rockford, the Rockford Area Economic Development Council, Habitat for Humanity and the city’s Zoning Board of Appeals, to name a few. As the partners look toward the future, mentoring the next generation is front of mind. After 51 years, the firm has plenty to be proud of. The group has won numerous awards, including several from the AIA, the ALA, and the Illinois Association of School Boards. In 2009, the AIA’s Northern Illinois Chapter named it outstanding firm of the year, and in 2013, the Rockford Chamber of Commerce named it Small Business of the Year. Saunders’ work with Danfoss, in Loves Park, Ill., and Duo-Fast, in Huntley, Ill., has also won several honors. There’s a story at Larson & Darby about the year when a band failed to appear at the company Christmas party. So, for entertainment, co-founder Sam Darby led a slideshow of memorable works created by his firm. “You would have thought they were family pictures, because he spent two hours talking about the pictures and sharing his love of these buildings he had been part of,” recalls Waldorf. After 51 years in business, it’s easy for Larson & Darby associates to point out their firm’s work around Rockford. After all, their office provides a daily reminder of the company’s humble beginnings. This entry was posted on Friday, December 12th, 2014 at 12:00 pm	and is filed under Northwest Business Magazine, Top Posts. You can follow any responses to this entry through the RSS 2.0 feed. Both comments and pings are currently closed.